It’s the last week of 2014 and we’re going out with a bang. Or should I say, we’re going to try to empty the refrigerator and freezer this week. We bought a 14 lb. turkey before Thanksgiving (it was on sale for $4!) and I’m going to cook it this week. We’ll have amazing leftovers, plus I’ll get a huge empty spot in my freezer. We had a ‘leftover’ night last night just to try to get the fridge cleaned out too. How does this much food accumulate in such a short amount of time?! 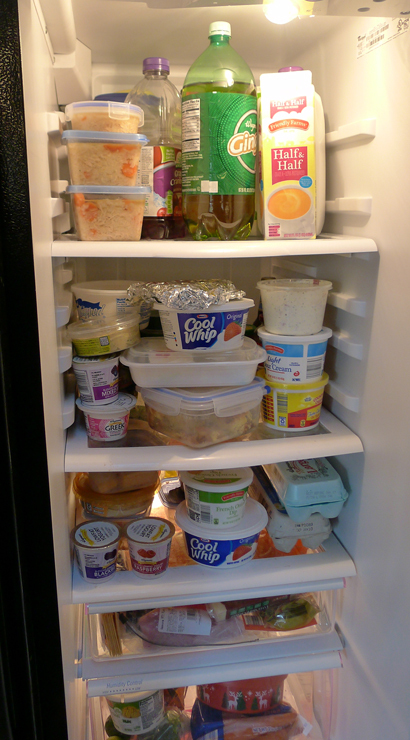 What a mess — how many cool whip containers can one refrigerator hold?? And guess what? None of those containers actually has cool whip in it! So yeah, it’s time to clean out the fridge. Especially since it’ll be full of turkey after today. This entry was posted in menu plan and tagged dinner, menu plan.